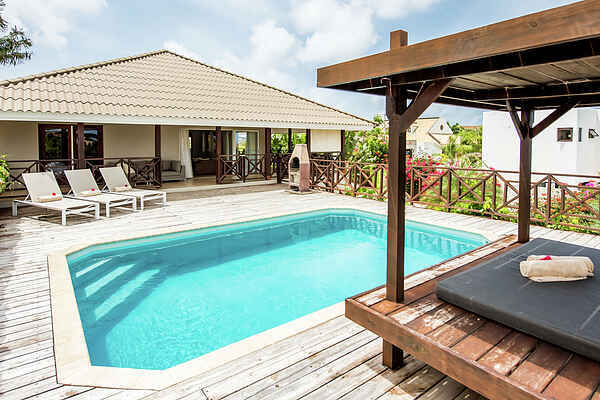 Villa Morning Glory is a wonderful tropical villa with a private swimming pool in the popular Jan Thiel neighbourhood. Also known as the Saint Tropez of Curacao, there is always something happening on this part of the island. The villa has a distant view of the ocean and can accommodate six people. This extremely comfortable villa has a beautiful garden with a private swimming pool. It also has a hardwood pool deck with sun loungers and a gorgeous Bali bed. The climate and the refreshing sea breeze make outdoor life on the wooden verandas very pleasant. Morning glory is fully equipped with all modern comforts. From the veranda, you can overlook the private pool and a small part of the sea. Morning Glory is located within walking distance of the beach (Jan Thiel/Zanzibar). The famous Jan Thiel luxury villa estate is located directly on the seafront and is one of the most beautiful parts of Curaçao. With its beautiful views of the sea, the city, the Spanish Water, Caracas Bay and other panoramic views, this luxurious villa neighbourhood is popular among Dutch people who have a second home here. Willemstad is the capital of Curaçao. The city district encompasses multiple neighbourhoods, of which Punda and Otrabanda have always been the most important districts. Behind the Harbour is the shopping district of the city.